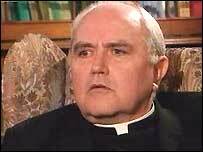 Dr Hegarty admitted imposing a levy on all parishes within the diocese to raise money for the fund. His statement said that he "sincerely regrets" the disquiet caused by donations being paid into the trust. It also said a letter explaining the church's obligations would be circulated throughout the diocese as soon as practicable. The statement said: "The issue of child sexual abuse is one that has been enormously damaging throughout Irish society. "The Catholic Church in Ireland has a responsibility to ensure that for its part, efforts to address the issue are properly and promptly resourced. "Like diocese throughout the country, the Diocese of Derry takes its responsibility to contribute to this effort extremely seriously. "To this end, we have acted quickly to meet our financial obligations in relation to the Stewardship Trust Fund. "In some quarters, disquiet has been expressed that a recent inaugural payment was made by the diocese before all parishioners had been informed of our new obligations." Speaking to a BBC reporter as they left Mass at Saint Eugene's Cathedral in Derry, some members of the congregation said they did not agree with their donations being given to the fund without their knowledge. They said any money they had given specifically to their local church should be spent on it. Frank Curran, former editor of the Derry Journal, said he believed some Catholics in the town would defy the church and withhold their contributions altogether. "This is more or less a fine on something that we believe the clerical Church as a whole should have been capable of dealing with themselves," he said. "Catholics in general feel very bitter about the number of (abuse) cases that have come to light. "They certainly don't feel any responsibility for what happened and they think it should be a matter for the hierarchy to settle on its own." Meanwhile, the Bishop of Down and Connor, Dr Patrick Walsh, has said no parish collection money or diocesan appeal money had been put into the fund. He said the annual Down and Connor contribution to the fund was £266,999. "The only money used for the Stewardship Trust is money not ring fenced for a specific purpose, for example money realised from the sale of diocesan land or property," he said.